Product prices and availability are accurate as of 2019-04-11 16:50:03 EDT and are subject to change. Any price and availability information displayed on http://www.amazon.com/ at the time of purchase will apply to the purchase of this product. 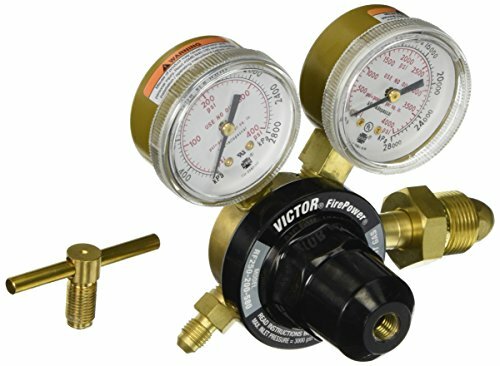 The Victor 0781-9851 250 Series Medium Duty Inert Gas Regulator features a forged brass body and housing cap for increased durability. The single-stage design delivers excellent performance. It also has a robust stem-type seat mechanism that ensures long regulator life and a powder-coated bonnet that provides increased strength. Other features and specifications: Dual scale gauges with easy-to-read display graphics Delrin cap bushing for smooth adjustments Sintered inlet filter Maximum Inlet 3000 PSIG CGA Range: 580 CGA, 10-200 PSIG Fabric-reinforced neoprene diaphragm.